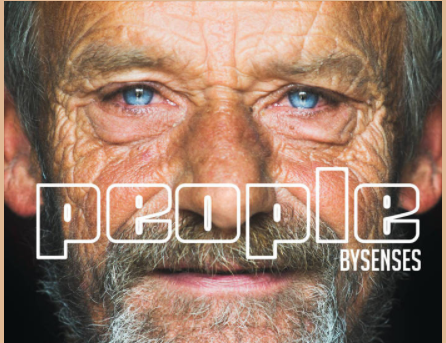 People is the third album of BySenses, this time as double CD available through either BySenses’ bandcamp page or Wool-E Discs. 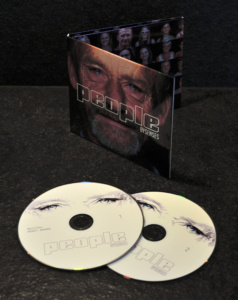 The CDs are packed neatly in a trifold sleeve with glossy high quality artwork. The photographs of random people were made by Sarah Joos, the graphic design by Alain Kinet. Overall I was very impressed by this album; the variety in it never ceases to tickle the imagination; there is something new around every corner each time you listen. Like a decent 12-year-old Scotch, it takes a few times to get to the bottom of all the complexities hidden inside. Throughout the complete work, the music and the graphics, you will feel the personal involvement of BySenses. It is a conversation by means of art, truly emotional. Intro: The intro is very cinematic, it holds a layer of suspense. A truly nice stereo image. But beware: it is not a synopsis of the complete album (though we will get back on this.). People: This track is boldly experimental. After 1.5 minute the voice of artist Thomas Betsens kicks in. Too bad the the lyrics are not posted; I think the text is something on its own to ponder about. The soundscape is very ambient, cosmic. When a subtile sequencer kicks in, the track picks up more speed. After 8 minutes the piece gets lengthy; especially the voice with the chorus effect in fifths lacks variation. It’s where the track is not halfway, but there is a small break after about 12 minutes. Altogether this builds a very intimate atmosphere with the listener, it is very up close and personal. That was the main goal of Thomas, and he succeeded. I would say, this is where drone ambient crosses progressive rock. The fade-out ends this track abruptly. Sensitivity: Another track with improvised singing by artist Thomas Betsens, in the same chorus effect. Every aspect in this track rolls in and out in waves. It is an interesting mix of soundscapes displayed over the constant singing. The lyrics have been improvised during the recording of the track, thus providing the listener with a snapshot of the interacting thoughts of BySenses and Thomas. Before birth: it is a speedier track with samples of Greet Laebens. Slow drums but speedy sequence-like complex filtered background instruments, cast into very fluent choirs and strings, seasoned with extremely well-placed whistle lead and high pitched sound effects. This is the typical BySenses sound. In contrast to the previous two tracks, this music carries a happier atmosphere, it brings joy (and as the title implies, so it should!). Short memo: A fast track, with very much variation in it. It’s loaded with interesting sounds, never losing track of the harmony. Fast paced drums, and overall a nice warm sound, with elongated strings and pads in the background. Nightdancer: Evenly fast paced as the previous track, this one has a more “Far East” atmosphere over it. Nice floating leads perpetuate over a great sequence. Almost 7 minutes long the track keeps building up energy, then completely crystallizes into a tranquil pool of vintage calmness. Why Hurry@Midnight: My personal favourite. It starts with a minimalistic sequence, and piano. On the way choir and warm pads join the trail, but the piece remains calm and quiet, radiating a peaceful, lovely and intimate pulse. Whispering: This has a more dramatic tone. The slow, almost tribal drum, fades out to very quiet passage. After a whispering, drums pick up the track again. By the end, the whispering returns but now it sounds twisted, in an uncomfortable way. Strong message. Nobody’s name ends: Suspense in a very deep and short drone, this fits most to “Intro”. Again a very cinematic sound. On CD1, the circle is round. I personally think BySenses should investigate this corner of music furthermore in a future album. People (Guy TALLO Mix): Expect not the unique sound of BySenses at all, it’s a slow dance beat that hints back to some elements of the original track “People”. Overall it sounds strongly like Vector-Lovers or William Orbit in the Madonna/Ray Of Light era. Very much oomph, and late-80’s synth string chords. I would not be surprised if this would make it to the national radio charts (Studio Brussel). Before Birth (Extended Version): It’s virtually the same as the original “Before Birth”, but now with a further instrumental elaboration. The drums in that extra piece are great! Live Post X Sessions – With Thomas Betsens: this may be the odd one out but certainly deserved its place on the bonus CD. Looping and low-fi, this is a very different approach. Experimental, but a great job in that. It is a floating dialogue between Thomas, BySenses and the listener. Next: Details for COSMIC NIGHTS 2018 revealed!